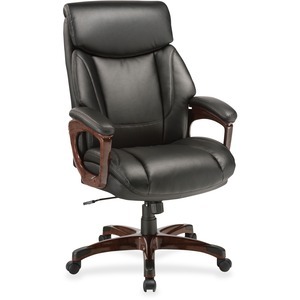 High-back executive chair features bonded leather upholstery for a luxurious seating experience on extra-soft, high-density foam. The fixed arms are also padded and upholstered in matching PVC so you can sit back and relax. Arms and frame feature a wood-look hydro sublimation with a Mahogany finish to match your decor. Customize the chair for the ideal position with comfort functions including pneumatic seat-height adjustment (3-1/2" from 20-1/2" to 24"), back tilt, tilt lock, adjustable tilt tension and 360-degree swivel. 27-1/2" nylon base is equipped with 2" hooded, dual-wheel casters for easy chair movement. Seat measures 19-1/4" wide x 17-3/4" deep. Back size is 22-7/8" wide x 24" high. Weight capacity is 275 lb.